Sam moved from San Diego to New Orleans three (3) years ago after the death of his mother. While the move came with its challenges and obstacles nothing could have prepared Sam for his current struggles. On February 13, 2018, while enjoying the city’s Mardi Gras celebrations and festivities, Sam was shot in the head. The bullet caused major damage to the right side of his brain. The bullet and its fragments still remain lounged in his head. Doctors performed emergency surgery to relieve the pressure from his skull and the fluid built on his brain, necessitating the need to cut a portion of Sam’s skull out to save his life. Sam was diagnosed with a Bilateral Frontal Subdural Hematoma with Traumatic Brain Injury (TBI), left hemi paresis, and dysphagia with peg tube status. He is unable to walk or speak. His communication is limited to simple hand gestures. He is paralyzed on the left side of his body and receives his meals through a tube. He has recently begun to suffer with seizures. Currently, Sam receives Physical Therapy, Occupational Therapy and Speech Therapy. As a part of Sam’s treatment plan, medical personnel have suggested that he receive Hyperbaric Oxygen Therapy. This treatment plan recommends twenty (20) sessions. Each 90 minute session cost around $220.00 each, totaling $4,400. Technological devices are also needed to improve his communication skills. 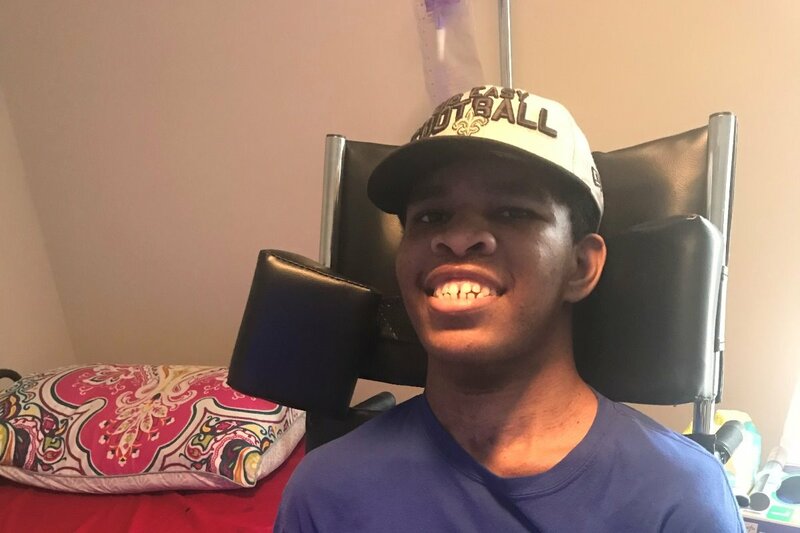 As the family contemplates Sam’s home plan, there will be a need to have a van with wheelchair accessibility and a motorized wheelchair that uses technology to operate its movements. The family will also need to move into housing with wheelchair accessibility and ADA compliance. Sam’s recovery will require a great amount of patience, time and money. Family, friends and community supporters can help ease the financial burden on his family and improve the life of Sam through this effort. Sam is an example of God’s grace and mercy. We will continue to lift up his story of survival as a testament of our faith. As believers, we pray that you will find it in your heart to contribute to this campaign and aid Sam and his family in this time of need. Donations are also accepted at any Capital One Bank and through the mail, P.O. Box 870024, New Orleans, LA 70187. After nearly nine months, Sam was released from the hospital where he was receiving impatient physical, speech and occupational therapy. This was only a prelude to the next necessary step on Sam's journey. Earlier this month, Sam had a scheduled surgery to replace the frontal part of his skull that was removed during his life saving surgery. He then had an emergency surgery to stop bleeding in his head. Today Sam is at home healing. He is going to have the staples removed from his head in January and then he will begin his out patient rehab. Sam and his family are truly grateful for the support, prayers and love seeded to him. He gives thanks daily for grace and mercy that God has shown to him. The link below is a demonstration of the blessing God allowed you each to be a part of. 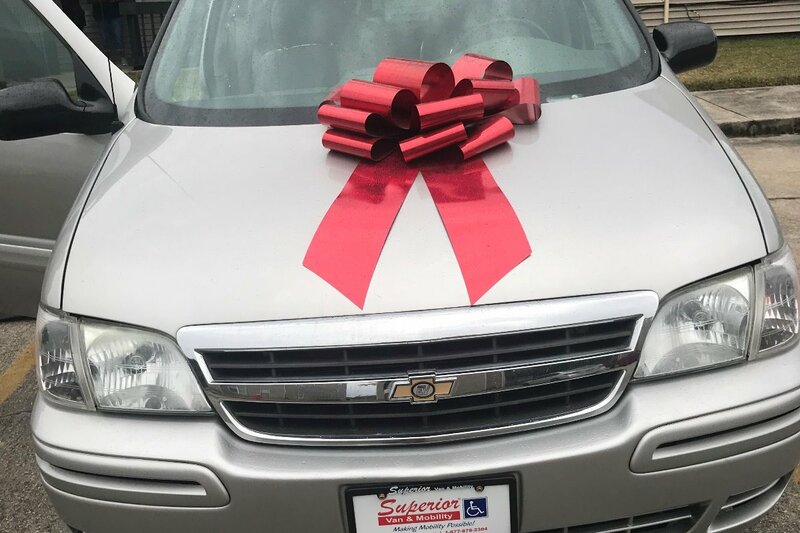 Thank you, Demario Davis (a Real Saint), The New Orleans Saints (Ms. Gayle Benson), Superior Van & Mobility, Juliana Mazza (WDSU) and donors like you. Here's an update for all of you who have prayed for Sam's healing and donated to his GoFundMe account. I serve as Sam's legal counsel and I set up this account to help raise money to cover expenses associated with Sam's injury. The monies/donations given by you are managed by me and Sam's aunt (Allieta) for Sam's benefit. Your donations helped the family to relocate to a handicap accessible home for Sam earlier this month. Also, your donations have helped to cover the cost of a communication device for Sam. Sam has many expenses associated with recovering and is now directly involved with how best to use the funds for those expenses and his recovery. After nearly nine months in the hospital, Sam was released from the hospital and able to go home with his Aunt earlier this month. He will now receive treatment as an out patient. While his progress has been positive, he has a lot of work ahead of him for a full recovery. He must still receive physical, occupational and speech therapy. And, he will need to have another surgery to replace the frontal skull in his head. Sam sends his gratitude of thanks to each of you. The attached picture shows his improved writing skills with, Thank you. The other picture show his verbal communication device. He says, Thank you. Your kind donations are greatly appreciated and very much needed. We are all thankful for your prayers, comments and financial support. Our Good News it that Sam is preparing to go home. Sam is enrolled in school and working toward completing his 12th grade course work. He is looking forward toward graduating this school year. Sam has also registered to vote and is excited about exercising his power to vote for the first time. God has truly blessed us and allow us daily to see our faith at work for Sam's healing. Sam has spent almost nine months in the hospital receiving great care. A typical day for him includes hours of physical, occupational and speech therapy. We are appreciative for the doctors and staff at Children's Hospital for their dedication and expertise in helping Sam recover. 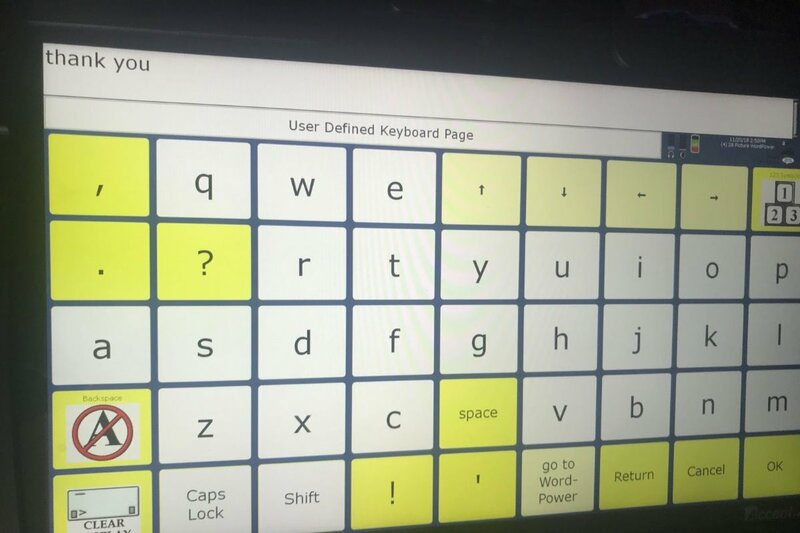 As Sam prepares to go home, he must use a wheelchair and a communication device. He is forunate to have both of these items for his use. However,there are still needs that are unmet. In particular, Sam will receive his therapy as an out-patient. 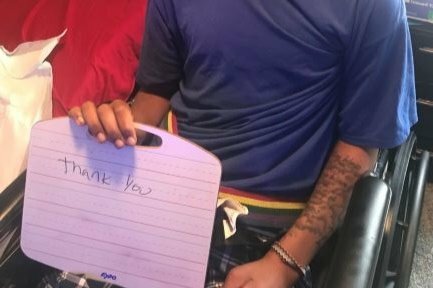 The family is in need of a van with wheelchair accessibility to bring Sam back and forth to those therapy appointments. Any contribution you can make toward the purchase of this van will be greatly appreciated. 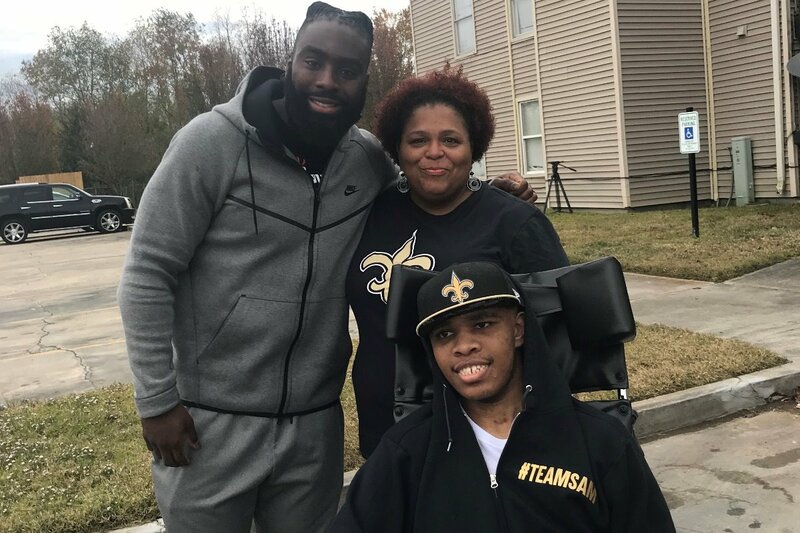 Sam was surprised and encouraged by a visit from two of his favorite Saints players - Alvin Kamara and Demario Davis. 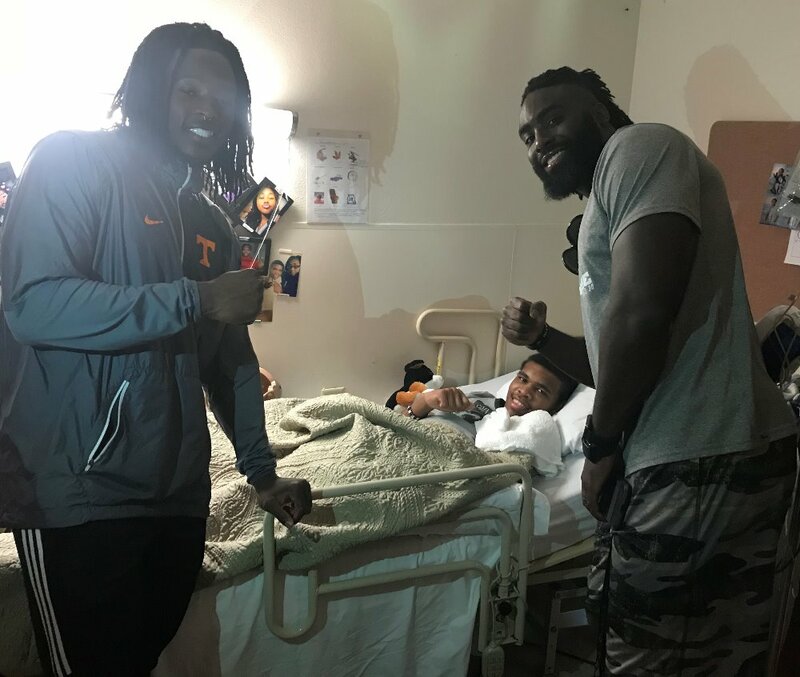 Even though Sam was unable to talk with them, his smile and fist bump showed his gratitude for their visit. His spirit was indeed uplifted. Demario also led a heartfelt prayer with the family. We are encouraged by the outreach of the community and look forward to sharing other updates with you.